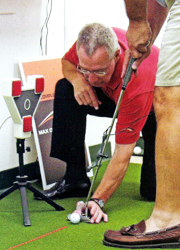 The Complete Golfer has the most accurate and comprehensive measurement and diagnostic systems available. The analysis of your performance, we will identify the appropriate adjustments necessary to provide the optimum combination of shaft, head, golf ball and putter fitting for your game. Come in an put our technology to work for you. It will be the best investment you ever make for your golf game. SHAFTMAX – Shaft Dynamics and Load Efficiency Analysis will help identify the efficiency of you shaft load profile. 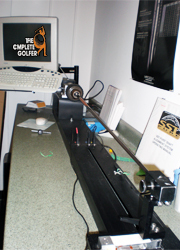 With ShaftMAX's proprietary wireless strain gauge technology, we can acquire and measure the deflection you put on the golf shaft during the entire swing. This data will aid us to determine what shaft material, weight and playing characteristics will give you the best feel and overall performance. LAUNCHMAX – Ball Speed, Spin and Launch monitor will examine which driver loft, center of gravity, and golf ball best fits your game. 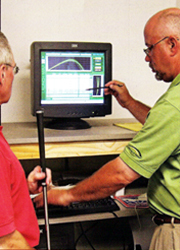 Research has shown 1,000rpm can make a difference as much as 15-25 yds with your driver. With the LAUNCHMAX we can determine the best launch angle and ball spin combination to help you achieve the longest, straightest and consistent flight pattern. SST PURE is a patented process of shaft alignment that quickly analyzes and locates the neutral plane in each golf shaft. Using the patented SST PURE shaft Alignment System allows the club maker to assemble the club with the shaft in the SST PUREd position which will reduce off-line twisting and bending during the golf swing and impact. The fact is, no shaft is perfectly round, straight or stiff throughout its length. Despite modern manufacturing techniques every golf shaft, whether steel or composite, remains as unique as a fingerprint and cannot be fully analyzed until after the shaft has been manufactured. 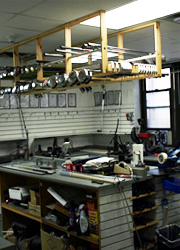 Over the years SST has PUREd golf shafts for more than 200 members of the PGA, Champions and Nationwide tours. On the PGA TOUR alone, players using SST PURE technology won more than $56 million in 2005. Some of the most prominent names in golf are among those players using SST's technology.